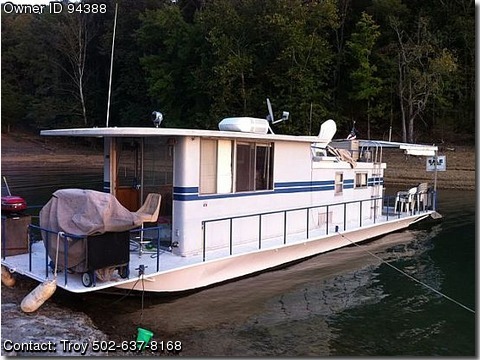 Call Boat Owner Troy 502-637-8168 502-751-5632. Belts, battery, water pump and distributor on engine replaced 2011. Exterior painted in 2011, fiberglass roof coasted in 2009, sleeps 6, sofabed and 4 single bunks in rear, microwave, gas stove top, holding tank, fresh water tank, 1 bath no shower, outside shower, am/fm radio, marine radio, lots of storage, ac, roof gas electric fridge, covered rear deck grill, interior furniture, sofa with hide away bed, table with 2 chairs, all bedding, exterior furniture table and chairs exterior, berber carpet inside, tv steel hull, swim platform on back adds another 2ft to overall length.